Tech is a popular industry to work in, partly because most tech jobs pay very well. But where can you find jobs with great tech companies? Well, job boards are one place you can start. We put together this list of the 55 best tech job boards so you can quickly and easily find jobs in your city to apply to. After this we’ll cover some tips for applying for jobs and other resources that’ll help you land your next job in tech (whether you’re already a programmer or other tech worker looking for a change, or whether you’re looking for your first job in tech). I worked as a Tech Recruiter in the New York City market for pretty much all of 2015, and Dice was one of the first places we looked to find candidates. It’s an extremely popular IT job board. I’d start here. Hired is another great job board known for focusing on information technology positions. It’s one of the first tech job boards I’d check out when applying, along with The Ladders and Dice (listed above). Angel.co is a HUGE site… sort of like LinkedIn for entrepreneurs and tech founders/tech workers. And now they offer job listings too. So while it’s not only a tech job board in terms of what you can find on the site, it’s one of the best places to quickly find job leads in the companies you want. Highly recommended. The Ladders isn’t only a tech job board but it’s the second place I looked as a tech recruiter, when it came to the job boards I scanned through once per week. Why? It tends to attract higher level people (the job board started out as “$100K+ jobs for $100K+ people”. They backed down from that slogan and exclusivity but it still attracts high level job seekers, and therefore high level employers like many of the tech companies you probably want to work for. If you follow tech at all you might know about the popular blog TechCrunch. 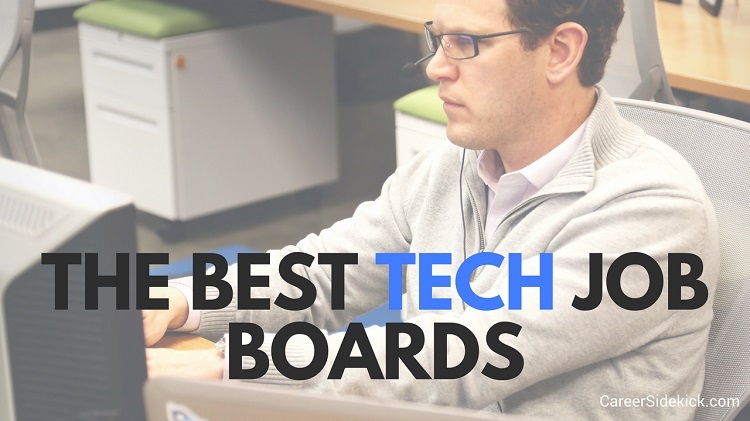 Well, CrunchBoard is their job board and it lists some great tech jobs that are worth checking out. Like most job boards, you can search by location and keywords. Some of these IT/tech job boards are focused on certain niches… everything from Virtual Reality to a certain programming language like Ruby or Python. If you’re on the creative side – design, marketing, user interface, etc, keep reading because we’ve included those too. If you’re a designer, marketer, copywriter or other “digital creative” looking for the best job boards, some of the websites above will help you. However, some are geared heavily toward programmers, data scientists, and other information technology workers. Okay, now that you know 54 of the best job boards to find tech positions, here are a couple of resources that might help you. How to write a stand-out cover letter. Some job boards will give you a chance to provide a cover letter. Here’s how to do it in a way that’ll set you apart and get you the interview. Here’s an article on how to find a job without any work experience. If you are a recent graduate or someone looking for their first job in tech without any past experience, this will help you immediately. Next, here are 8 tough brain-teaser interview questions asked by Apple, Google and other tech giants. Tech companies love to ask tricky questions like this so once you get interviews lined up, take a look at that article to mentally prepare for the types of questions they might throw at you. And here’s how to create the best elevator pitch possible for when they ask you “Tell me about yourself” in the interview. Usually this is one of the first things they’ll ask when you get on the phone with them, so it’s something you want to prepare for.